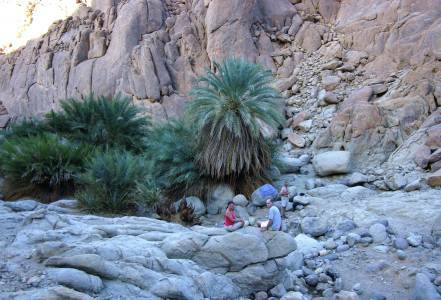 The Jebel Uweinat is a small isolated mountain massif in the three-country corner of Libya-Egypt-Sudan. It lies in a hostile hot desert region, far from the civilization. The climatic conditions are due to decades missing rainfall for vegetation extremely difficult. 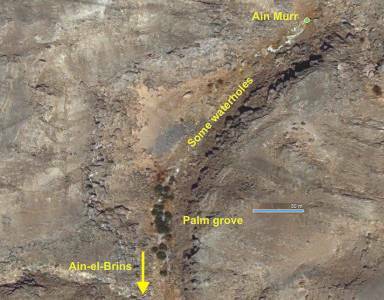 Today, trees in the rugged terrain of the mountains only in dry wadis can surviving. There are only acacias that with their long roots the remaining water reservoirs in the underground use. In the past, the climate in the Uweinat was much friendlier for the vegetation, then in the recent past with a tendency to deteriorate. That is documented by many rock paintings from the Neolithic period and the remains of dwellings of the residents of the last nomadic Tibu people. The Egyptian Ahmed Pasha Hassanein was the first explorer to reach the Uweinat in 1923. The settlement was already over at this time. The Uweinat was apparently visited only occasionally by the descendants of Tibu. Today only interested trekkers traveling in the Uweinat and walk far on the plateau. Smugglers and camel-caravans to pass only the peripheral areas. After robberies on trekkers in recent years is the official way to reach the Uweinat is now severely limited. 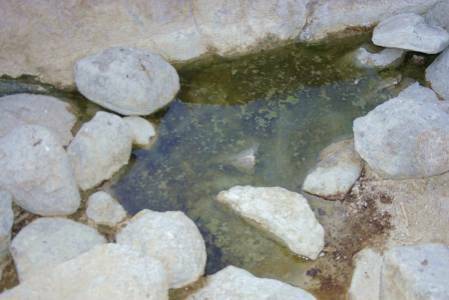 There were and are still several permanent water sources (Ain) in dry wadis. They are leachate sources supplied from the mountains. Known are Ain Zueia, Ain Dua and Ain Duarme in the Libyan part, and Ain Murr in the Sudanese part of the Uweinat. 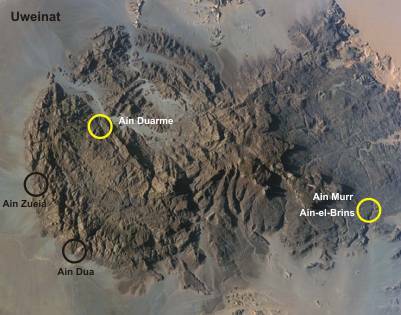 For a description of a Tibu in 1933, an as Ain-el-Brins named water hole should be somewhere between Ain Dua and the Karkur Murr (Ain Murr). 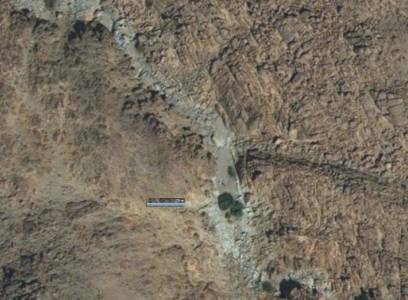 Considered are small Gueltas in the lower course of the Wadi Wahesh. But they are only temporarily filled by rainfall. 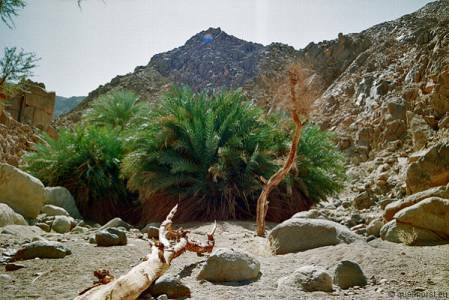 Since the 30s could be known, that date palms (Phoenix dactylifera) grow at the water source of Ain Murr (in the Karkur Murr). The first mention and images were but only in 2002 by Andras Zboray (fjexpeditions.com) published. He had led a trekking group. Also at Ain Duarme, in a side branch of Karkur Ibrahim, date palms are now documented photographically. 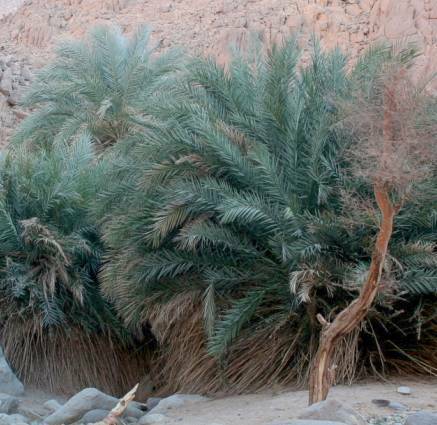 How is it possible that date palms grow in the difficult climatic situation in the Uweinat. They are certainly here not more viable and are already extinct. Within a radius of hundreds of kilometers there is no source for date palms. 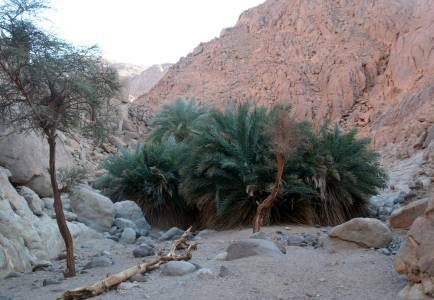 Therefore, it is almost certainly just a pure coincidence, that date palms grow near water sources in these dry wadis. Obviously, before perhaps 100 years, people in these two places rested and have eaten date fruits. 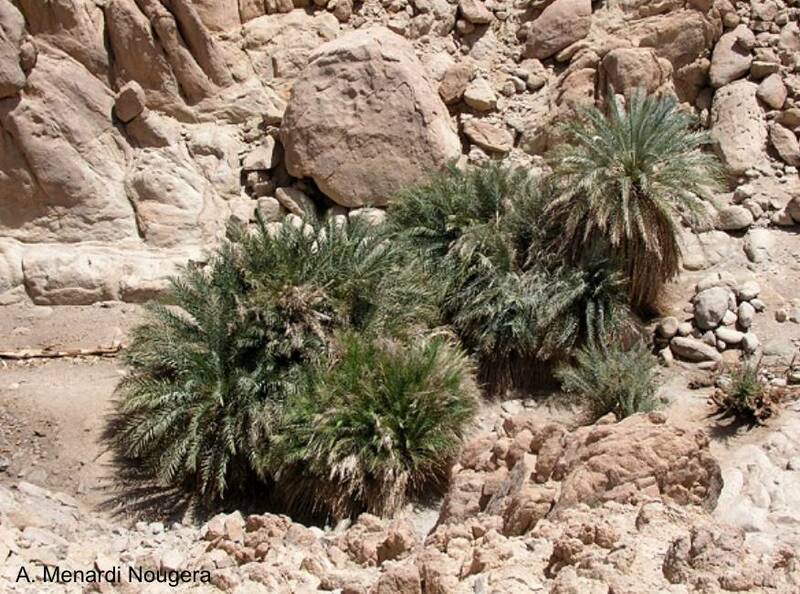 A reproduction of the date palms of the Jebel Uweinat is obviously not possible. They do not bear fruits. There are only dwarf palms. Date palms have either only female flowers (they provide the fruits), or only male flowers (they provide the pollen). Wind or insects take over the pollination of female flowers. Obviously, here grow only male or female specimens isolated.